Racha Noi – South Tip is an exceptional dive with an element of danger to it too. 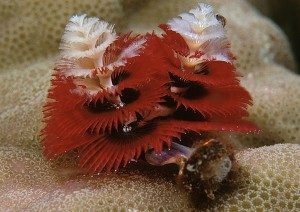 The huge boulders and strong currents, along with large pelagic fish which are spotted frequently, really does make this a very special dive site, and one of the most famous in the whole area. 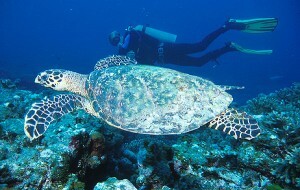 South Tip is a completely different animal to most other dive sites in the region. One minute it can be flat calm seas, and then the wind and tide can change and its Rock n Roll time. The currents out on this dive site can be strong, and it can be difficult to find a sheltered area. The currents are really great if you like drift diving, there are only a couple of other sites in the Andaman Sea that are smashed by strong currents like here. Hin Muang (in the south), Koh Tachai (in the North) and maybe Elephant Head Rock in the Similans, do not get me wrong though, it is not strong currents all the time, just on occasion. So it is wise to check the conditions before entering the water. 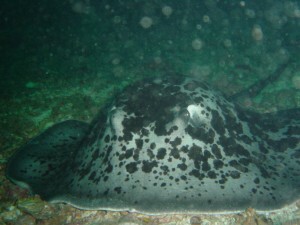 Care should be taken on Racha Noi as on any other dive site. As the currents arrive on the tip from two angles, the tide comes running down both sides of the island and this effect can cause a downward current effect, and it can force the diver back down, it all makes for much fun. South Tip itself is formed by many large strutting boulders, the boulders start at about 12 meters and drop dramatically down to the deep depths of 50 meters and then beyond, so it is wise to keep an eye on computer depth gauges here too. This area is a mecca for the large fish that come to feed here. 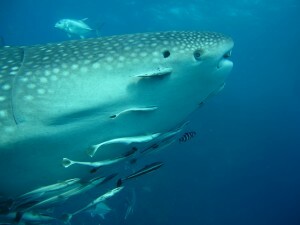 Manta Rays and Whalesharks are frequent visitors, because the site is such a deep drop off, the large fish love to swim up from the deep hurling themselves towards the surface, gulping down masses of plankton that collects there. The current also helps to attract the bigger predator boys too. 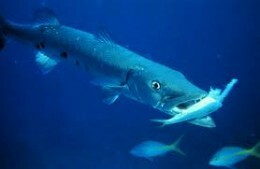 Giant Barracuda, Giant and Yellow Fin Trevally, Dogtooth Tunas and other Jacks zing through the water, like brilliant flashes of colour, using their own power and the power of the sea, too much success, propelling themselves quickly as they stalk prey. A good tip for divers here, is to hover around the tops of the boulders and just watch these guys go at it. They are top of their food chain and they really are in control. Level of difficulty: Advanced open water upwards.